It is hardly possible to find a person who seems to be totally happy with the current position or occupation, and would gladly refuse a promotion. We all always aspire for better and dream about becoming bosses or chiefs, receiving more money and living a more advanced life. And it happens all around: some people try doing everything possible to get promoted faster, but the bosses keep on not noticing them and giving them no promotion. Whatever they choose to blame: their bad luck, their family or personal problems, their colleagues, their bosses, or bad alignment of the stars, most likely they have only themselves to blame. Usually, their wrong or unethical behavior, bad habits, a lack of knowledge and other personal issues become key reasons why such people make bad impression and can not get promoted. Take a look at the list of the things you would keep in mind in case if you do not want to spend the life in sales management chair and want to get promoted. This list was recently published by a group of business management experts from the University of Harvard. Whatever it takes, avoid making too fast decisions. Certainly, being able to make bright and effective decisions is a unique and very valuable skill, but very very few people possess it. Most of the bosses like such subordinates who know how to make serious and right decisions, and all superiors are well aware about the fact that it takes time to make great decisions. Never lose control of what you are responsible for. Always try to play your role at your position in the most effective and the best way, never over-delegate or assume too much responsibilities. Always think about your subordinates and protect their interests. Never show a lack of motivation or enthusiasm in your working environment. If you want to get promoted and are trying to avoid the career killing habits, always show your desire to improve, your eager to learn new things, your sheer interest in work and appreciation for every new thing you have to learn. Never demonstrate improper behavior, even when you ave to deal with the most dishonest and nastiest people. If you like gossiping, swearing aloud to your contractors, shouting and showing aggression against your subordinates, telling lies to your colleagues and flattering your boss, you have quite fat chances for being promoted soon. Never be sure that your work and your success speak for themselves and give you a chance to obtain a higher position at work. Unfortunately, all people tend to notice and acknowledge only their own success and achievements, that is why there is nothing wrong about speaking aloud about own little professional victories, but in modest amounts, of course. Never get personal with your superiors. Never write personal letter, get too much relaxed and be sure that your boss is always looking at you as at his or her subordinate, no matter how friendly he or she is trying to behave. Never ask a feedback from your boss or your colleagues if you can not stand of critics and always get offended on any kind of criticism. Undoubtedly, it can be hard to cope with some critics, but being unable to accept criticism usually gives an impression that you’re not going to improve. Never speak too loud when you are at work. This is usually understood as the top of bad behavior and very much not recommended. Speaking loud looks not only as something impolite, but also as something that can give you an impression of a bad worker. What if competitors are listening to your talks? Never drink too much of alcohol at the office parties. Uncontrolled drinking can have very very serious consequences and in the worst case scenario can put the whole your professional career to end. The concept of transformational leadership was firstly introduced in 1978 by James McGregor Burns, who created The Model of Moral, Transaction and Transformational Leaders. Burns presented T-type leader as a person, who “… recognizes and exploits an existing need or demand of a potential follower… looks for potential motives in followers, seeks to satisfy higher needs, and engages the full person of the follower” (Burns, 1978). Later on, a famous theorist Bernard Bass has been investigating the issues of transformational leadership. He modified the Model of Burns, determining T-type leaders as leaders with higher requirements and personal qualities, like ability to mobilize a person to reach needs of higher level in Maslow’s hierarchy, or ability to change social environment, etc. In 1985 Bennis and Nanus did an experimental study, which helped to differentiate Transactional and Transformational leaders. These specialists launched principle of “4 I’s” for T-type leaders, which helped to clarify transformational concept (see previous article here). A modern American researcher Eric Rees offers a very interesting model for this type of leadership, which is called “Seven Principles of transformational leadership”. It illustrates structural approach to successful transformational leadership and can be useful for studying and consideration. The first is Principle of Simplification, which shows ability of a T-type leader to make the followers understand their final goals by creating transformational vision, the concept of particular organizational activity. The second is Principle of Motivation, which means encouraging, challenging and motivating people to develop organizational activity according to the vision. The third Principle of Facilitation means ability of a T-type leader to organize the process of learning, training or practicing, and to make it the most effective. The other Principle of Mobilization and Principle of Innovation display correspondingly abilities of T-type leaders to accumulate the leaders of lower levels around the vision and to launch any sort of changes, when they are required. Two last Principle of Preparation and Principle of Determination are the most important for transformational leadership. Preparation means readiness of a T-type leader to develop and strengthen his leadership by improving his personal qualities. Determination of such a leader shows his willpower to fulfill the mission of organization no matter what. 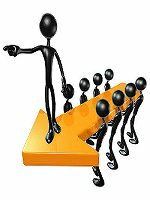 Some theorists criticize the concept of transformational leadership, blaming it in lack of ethical backgrounds. The idea that transformational leadership contradicts principles of organizational development is also among their counter arguments. Their opinion is that T-type leaders may not be successful due to their extreme determination and passion, which may mislead them and cause mistakes. In addition, such critics say that T-type leaders may easily manipulate with the activities of the followers, making them make numerous efforts beyond their own interests. But a number of management specialists, like Bernard Bass or Gill Hickman, see no reason to argue against transformational leadership. They underline that transformational leadership is a universal concept, which effectively works in different organizations and businesses. Besides, T-type leaders are individuals with very high moral and personal values, who always follow principles of freedom, equality and collective welfare. These leaders can solve the hardest and most complex organizational problems, because they are able to re-evaluate individual and collective values, motivate people, transform and restructure the group and lead it to success and achievements.